When you think of a Breton seaside town, the images that come to mind are usually those of a backdrop including a glorious seascape, sandy bays, fishing boats bobbing on the distant waves, moving inland to slate-roofed stone built houses, creperies, seafood restaurants, quaint streets and interesting little shops. Add, perhaps, a little history with an old church or chapel, and even better, a folklore festival involving dancing or Breton music. Take all of this, and you have an image of not just any old Breton town, but the town of Plestin les Grèves, or Plistin as it is known to its friends. Sometimes, when it comes to lovely little French towns and villages, less is more. Plestin les Grèves has just enough amenities to make life easy and enjoyable, with a good handful of shops, restaurants, a supermarket etc... but not so much that its essential character is taken away, spoiled for tourism and the relentless march of consumerism. Long may it stay that way. The supermarket (Super U) sells just about everything you could want anyway, with, perhaps, unsurprisingly, an especially good fish counter. The town has a market every Sunday morning, which is a boon if you haven't yet got used to the fact that most shops do not open on Sundays in France! There is another treat in store for those who like markets too, as mid-week sees an evening craft market set up in town, showcasing the talents of local craftsmen and women and offering a great opportunity to purchase original pieces. The whole of the areas around Plestin les Grèves is known for its beautiful beaches, so whichever you choose you can't really go wrong. Families love this part of Brittany, as the safe sandy beaches are perfect for enjoying days out with young children, and those with older children will also find that Plestin is ideal as there are a good range of exciting sporting activities, perfect for engaging the bored teens! 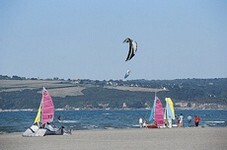 Send them off to try sand boarding, maybe, surfing, horse-riding on the sands, tennis, petanque, cycling... and many more! There are so many lovely places to visit within easy reach of Plestin that you need to spend plenty of time in the area to see it all! There is the gorgeous mediaeval town of Dinan, the seaside beauty and rushing river waters of Lannion, the lovely bay of Morlaix, or perhaps you might enjoy seeing the departmental capital town of St Brieuc. Then there are a million small villages and glorious landscapes to discover in between... take your time, hire a car, a bike, or simply walk to give yourself a chance to see and enjoy the best of Brittany. The nearest airports that offer flights from the UK are at Brest, Dinard and Rennes. Brest is served by flybe and Ryanair, Dinard by Aurigny and Ryanair, and Rennes by flybe and Aer Lingus. The TGV service from Paris to Brest will get you to Morlaix with no hassle and in very little time. Roscoff and St Malo are the nearest ferry ports, but it is an easy drive from the ports of Caen, Cherbourg and Le Havre should these suit you better. Property in Plestin les Grèves is always popular, as is any property on the lovely Breton coast, for obvious reasons. Close enough to the UK to make ideal holiday homes, properties here command good prices, and also good rental incomes. Do you know Plestin les Grèves better than we do? Do you have photos of Plestin les Grèves? WHERE IS Plestin les Grèves? Plestin les Grèves is found in north-west France. It lies in the north-west of the Côtes d'Armor department, very close to the border with the Finistère department. Access: By air: Fly to Dinard, Brest or Rennes. By boat: The ferry ports of St Malo and Roscoff are the nearest. Economy: The economy is typically bound up with the sea, both as a holiday seaside resort and as part of Brittany's fishing heritage. Interesting fact: Plestin les Grèves is sometimes also known as Plistin.